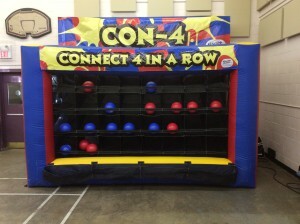 Larger than life inflatable Connect 4, provides all the fun of the classic kid’s game in adult size! Players compete with each other to try and be the first to get four balls in a row, but it’s not as easy as it looks. You shoot the balls basketball style into the top of the inflatable with each ball coming down into a given square. You have to use both strategy and skill to shoot 4 in a row and win!